Electronic operation better than old style "whistles"
P clamps sized for 1-1/8" and 1-1/4"
Chrome P-Clamp, 1-1/8" to 1-1/4"
Black P-Clamp. 1-1/8" to 1-1/4"
Chrome P-Clamp, 1-3/8" to 1-1/2"
Chrome P-Clamp, 7/8" to 1"
Chrome P-Clamp, 1-1/2" to 1-5/8"
DA-E: This is the most innovative product ever offered for mounting deer whistles to your Harley-Davidson motorcycle. 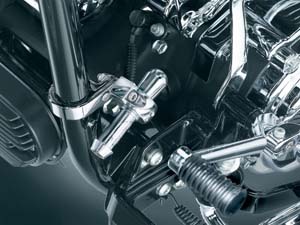 In just minutes, you can have added peace of mind, that until now was only possible by affixing deer whistles to your painted parts or front forks. 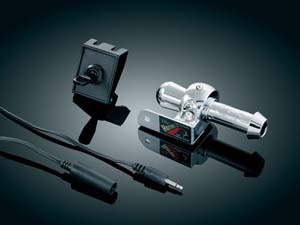 These handy mounts attach simply in minutes between your front turn signal/spotlamp mount and front turn signal using a single allen wrench. There are no modifications necessary and the mounts can be removed and re-installed just as easily. 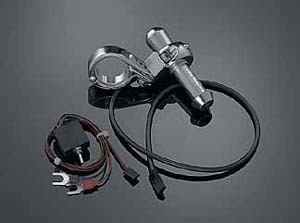 Included in the kit are a pair of mirror chrome whistle mounts, Bell brand deer whistles and mounting instructions. 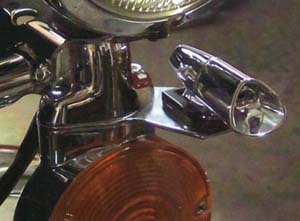 Fitment: '68 - current Harley-Davidson touring bikes with OEM front spotlamp/turn signal mounting bar using flat lens style turn signals. These include Electra Glide (FLH, FLT, FLHT), Road King (FLHR) and Electra Glide Sport (FLHS) as well as Heritage Softail (FLST) models. Note: Will not fit models using bullet style turn signals. The Hornet has proven to be the only device to effectively deter deer accidents. There are tens of thousands of Hornets in daily use with millions of proven miles. Regardless of speed, it produces a sound pressure of 120 db, & under most circumstances is very resistant to contamination. Regular inspection & cleaning is recommended. Proper placement is essential for maximum performance. The Hornet includes various universal mounting brackets, basic hardware & a switch. 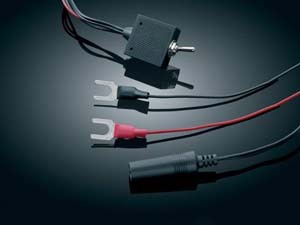 A separate motorcycle wiring kit is available & includes a harness & switch specifically designed for use on a motorcycle; while not required, it will make the installation much neater. 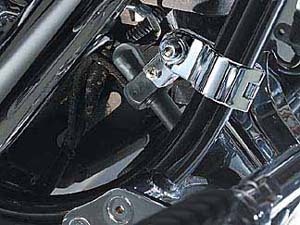 Our P-Clamps work great on many motorcycles to assist in mounting to frames or engine guards. 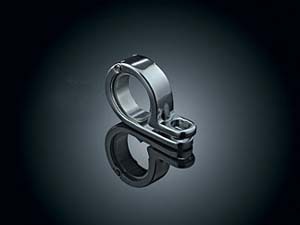 P-Clamps: One slick little clamp, our chrome plated stainless steel P-Clamp has many uses. It works great for mounting Silver Bullets or other lights to frame tubes or engine guards. Its hinged design makes installation easy. Mounting is very secure because our clamp is secured to the tubing by both a flat head screw and the fastener used to attach the accessory. The clamp has a 5/16" mounting hole. Also in black.